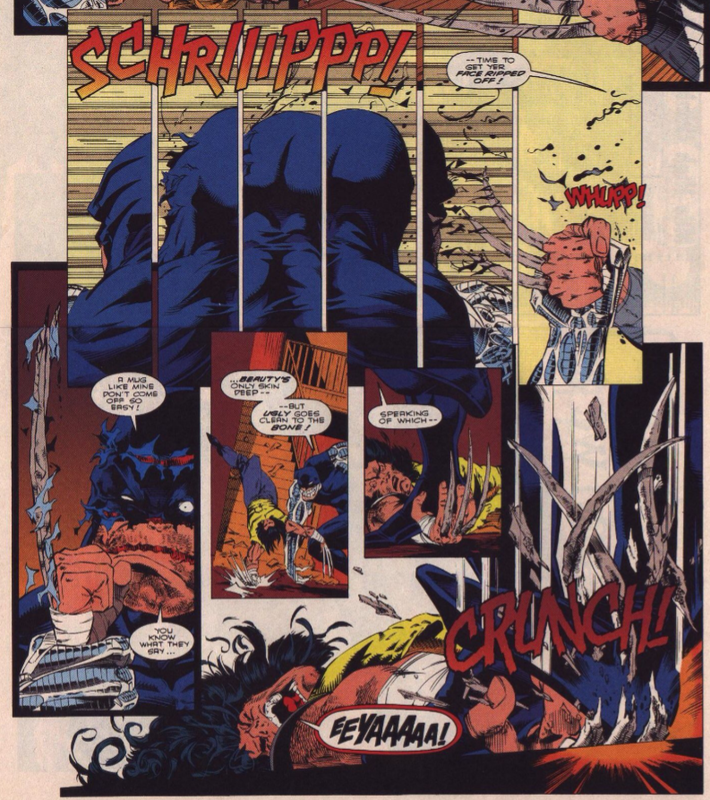 Having already battled him twice over in Marvel Comics Presents, this issue marks the first appearance of Cyber in this series, and he makes his presence known with a bang, breaking Wolverine's bone claws on one of his hands. The claws will remain broken for a time, as they gradually heal back to their original length over the next few issues, and Hama will continue to use Cyber off and on throughout the remainder of his run, including in the climax of his run, which will trigger the next big change in Wolverine. This is the first appearance of Zoe Culloden, an agent of the extradimensional law firm Landau, Luckman & Lake, and protege of the firm's previous representative in this series, Chang (who appeared back in issue #5). 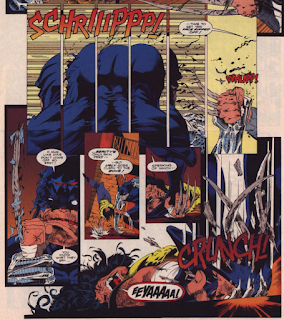 As the issue opens, she believes Wolverine is responsible for Chang's death, but he manages to prove to her that it was Bloodscream who killed him (in issue #6). Zoe will be a recurring presence (along with a few other LLL agents) for the rest of Hama's run as well, before eventually settling in for a recurring role in Deadpool's solo series. Cyber's real name, Silas Burr, is revealed this issue. Cyber is hallucinating throughout most of this issue, a reference to Wolverine having thrown him into a vat of hallucinogens in Marvel Comics Presents #85-92 (however, between that story and this one, the pair met in Marvel Comics Presents #132-136, and Cyber seemed normal - for him, at least). The title of the story is a play on the first line of the famous William Blake poem, "The Tyger": "Tyger Tyger, burning bright" (which, of course, is also the inspiration for Madripoorian crime boss/occasional Wolverine love interest, Tyger Tiger, as well). The moment it was revealed that Wolverine had bone claws, a Chekov's Gun was created, in which one immediately starts to wonder how long it will be before the newly-vulnerable claws are broken. 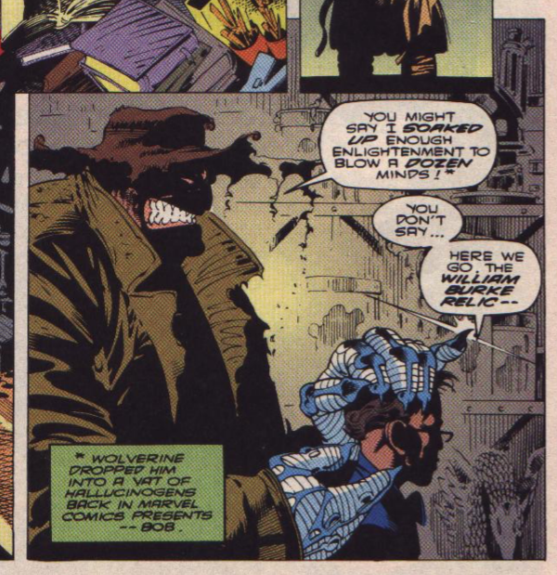 This issue fires that gun, and while that's a mildly significant moment (structurally, at least, moreso than narratively, as we'll see the breaking of the claws really doesn't turn out to be that big a deal for Wolverine), it's the character who does the breaking that is arguably more significant. Cyber was created by Peter David and has thus far appeared only in Marvel Comics Presents (and a David-penned X-Factor story), but he was introduced as an old foe of Wolverine's whom Wolverine feared above all others. 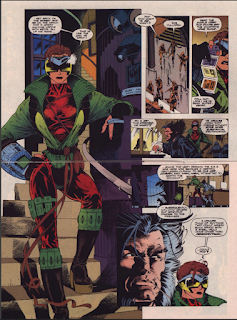 It was an attempt by David to shoehorn the character into the upper echelon of Wolverine's Rogues Gallery, and while Larry Hama isn't going so far as to directly agree with importance in this story, by bringing the character into this series, the closest thing Wolverine has to a "main" creator at this point is at least legitimizing Cyber as part of that Rogues Gallery. 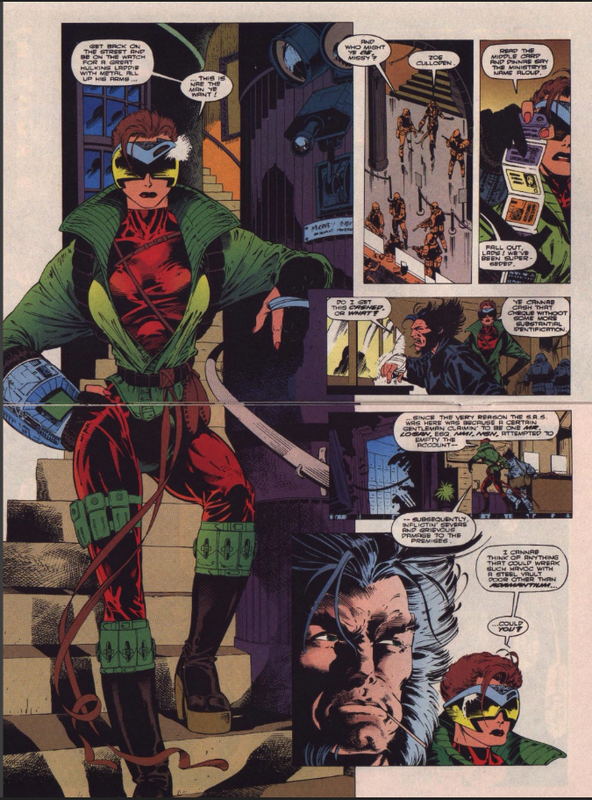 In fact, between Cyber and the reintroduction of Landau, Luckman & Lake (itself a creation of Claremont), this issue actually lays a lot of groundwork for the remainder of Hama's run (with both Cyber and LL&L popping up fairly regularly throughout it), and in that regard, it's an important issue to the post-adamantium period, even if the thing it's most remembered for is the very fan-friendly claw breaking moment. I've always been of the belief that a cover isn't what sells a book, the story is. Which I realize now is BS, because I bought this book at age 8 because of the cover. 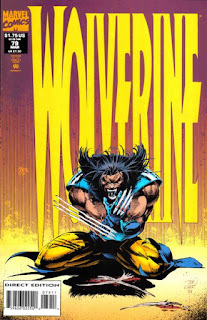 In fact, I remember going to the corner store with my dad, seeing the awesome cover, and then wondering how Wolverine's claws could break if they were unbreakable. It stuck with me so much that I made my dad take me back a few days later to pick it up. I was never big on Wolvie's solo series, but I collected the next several issues after this one, as well. It wasn't until I picked up X-Men #25 in the back issues that everything clicked. I thought it was a really interesting transition for the character, and this is what made the X-Men stand apart from other heroes for me: While Superman and Batman had essentially the same costumes and, to me, seemed to remain the same, the X-Men were always changing members, costumes, and having shake-ups. And sometimes the heroes didn't have to win, sometimes they died of the Legacy Virus or still couldn't control their powers, or they had part of their skeletons ripped out and had to deal with the fallout from that. The cover is often what sells a book the first time but the story is what keeps you coming back. Well, Batman had his back broken, and Superman died for a few months, only to return with a mullet. Yeah, I read comics for their stories, and buy comics based on the writer, but there's little doubt that the cover can have a big effect on what appeals to you scanning the stands. After all, if you haven't read a comic series before, then you won't know the story, other than what the cover is showcasing for you. I have always been drawn to painted covers. If I see a painted cover on a comic, it draws me to it. I remember looking through back-issue bins and coming across books I had never heard of, and quickly passing over the series, due to the covers not looking like something I'd want to read. Later on, I'd end up collecting a number of the books by discovering that those series actually were quality reads. Yet, those sub-par covers made me want to not give those books a chance. Oh, a bad cover will kill a purchase so fast. A non related comics example from my youth: I went to a bookstore one day and was poking through books, and one caught my eye for how awful the cover was. Looked like it was going for a poor man's Tron look, to show you how long ago it was. I scoffed, as young people do, and thought "That book isn't going anywhere." The legendary cyberpunk novel Neuromancer, by William Gibson, which, once it was reissued with a less garish cover and touting its success in the sci fi awards, I bought, and to this day it remains my favorite science fiction novel. A bad cover can do a lot. Zoe looks like she came right out of Alan Davis Central Casting. I would not expect a filing cabinet to take out Cyber, especially not to the point that Wolverine is referring to “slime oozin’ out from under” it.